With both his size and ability somewhat in question as he advanced to the NHL ranks, some were able to see the greatness of Wayne Gretzky immediately, with Glen Sather once stating, “It took one practice and one game. I watched him in the morning at the practice and I watched him play that night, and I was convinced that this guy was going to be an incredible player.” From the outset of one of the all-time greatest careers in all of sport and a tangible, tactile representation, we have a signed stick used by The Great One during his incomparable rookie campaign in 1979-80, where he wowed the hockey world with an unthinkable 137 points including 51 goals. Originally obtained directly from Wayne back in 1980 by an NHL official, the preferred Titan TPM model in solid white with red accents has “W. 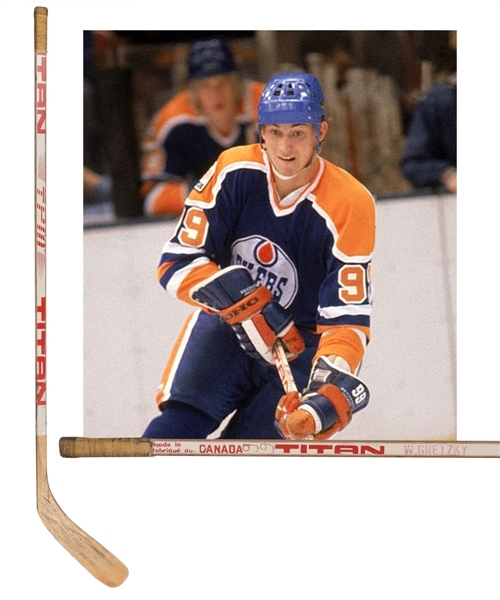 Gretzky” over the upper shaft in faded red, with “99” handwritten over the upper and lower shaft. The original now-discoloured white tape remains over the handle, with the blade originally void of any taping, with the smooth surface on both the front and back rubbed-over in black. An LOA from Classic Auctions will accompany. Utilizing shaved edges throughout it's length, the stick exhibits nice use, with marks and wear along with some red paint transfer over the lower shaft. Wayne has signed over the backside of the shaft, just below the first “T” of “Titan” near the handle, with the signature heavily faded and barely legible. His GMC linemates have also signed over the front side (Blair McDonald and Brett Callighen), with these autographs heavily faded and barely legible as well. We should also note someone crudely scratched illegible text midway up the shaft, with this unobtrusive and mentioned for strict accuracy.